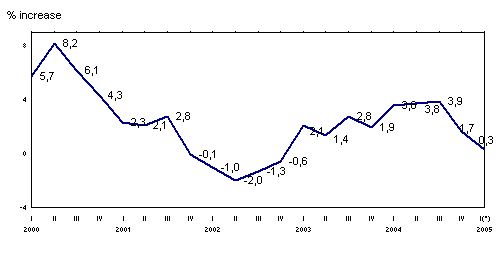 Industrial production in the A.C. of the Basque Country grew 0.3% in January 2005 in relation to January 2004, in homogenous terms of the working calendar, according to EUSTAT data. Compared to December 2004, industrial production in the A.C. of the Basque Country grew by 1.4% in January 2005, once seasonal effects had been corrected. Last December, this inter-annual rate had registered a decrease of 2.5% and therefore, inter-monthly evolution for the first month of this year points towards a recovery in relation to the last month of the previous year. If we consider the classification of the major industrial sectors, the evolution of the index for January 2005 in relation to January 2004 shows growth for Energy (1.1%), Capital Goods (0.1%), and Consumer Goods (1.0%). The latter is divided into Non-Durable Consumer Goods, which experienced 2.6% inter-annual growth, and Durable Consumer Goods, which registered a fall of 2.1%. On the other hand, Intermediate Goods showed negative inter-annual rates for January 2005, with -0.3%. There were positive inter-monthly variations for all the major industrial sectors in January 2005, in relation to December 2004: Capital Goods grew 3.4%, Intermediate Goods did so by 1.8%, Energy by 0.3% and Consumer Goods by 0.6%; within the latter, however, Non-Durable Consumer Goods grew 0.9% but Durable Consumer Goods fell by 0.1%. By province, the pattern of the inter-annual evolution of the Industrial Production Index varied, growing 3.6% in Bizkaia and decreasing 3.5% in Alava and 1.3% in Gipuzkoa. The pattern of inter-monthly growth rates, January 2005 in relation to December 2004 also differed between provinces, growing 2.6% in Bizkaia and 1.6% in Gipuzkoa, but diminishing 1.5% in Alava. Note: In accordance with Eurostat guidelines set out in the paper “Methodology of Short-term Business Statistics. Interpretation and Guidelines. 2002 edition”, Eustat, in its analyses from January 2005 onwards, will be using series corrected for calendar effects for the inter-annual (m/m-12) and accumulated (At/At-1) growth rates and deseasonalised series for the inter-monthly rates (m/m-1). The raw data will continue to be available to the users of the Eustat website and in the data bank.